Posted October 20, 2016 by Ian McArdell & filed under Episodes. 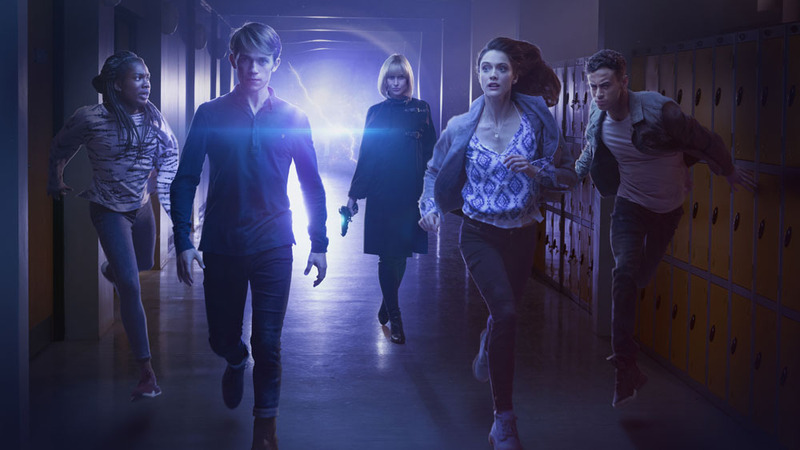 From the pen of YA author Patrick Ness, and the current Doctor Who production team, BBC Three’s Class feels like a far more confident programme than either of its Whonivese spin-off forebears. Set at the Coal Hill School, the parent show’s earthbound launch pad and latterly Clara Oswald’s place of work, it centres on a group of Sixth Formers and their intense physics teacher Miss Quill (Coronation Street star Katherine Kelly, also appearing this week in ITV’s HIM). 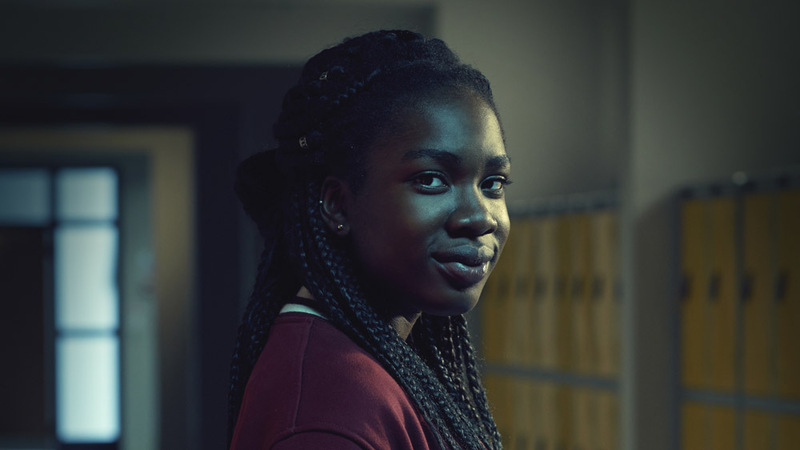 The group are for the most part outsiders; April (Sophie Hopkins), at the heart of the first episode, is a kind but lonely figure while the bright, smart-talking Tanya (Vivian Oparah) is socially misplaced by premature advancement to the Sixth Form. 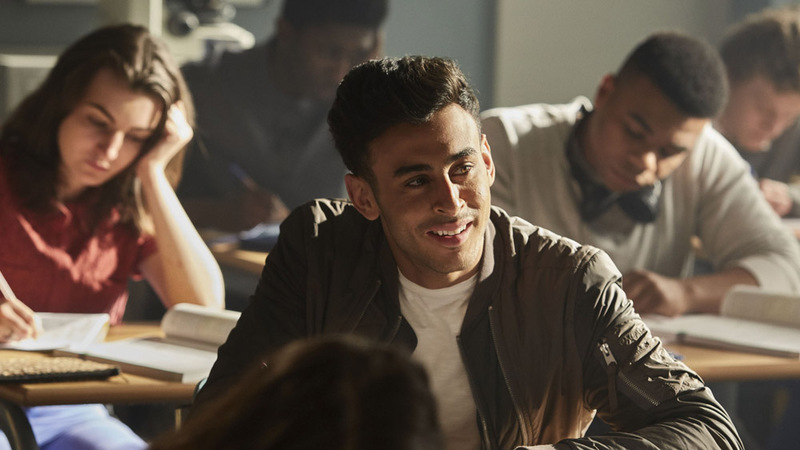 For the boys, Charlie (Greg Austin, Mr Selfridge) struggles as a fish out of water – Googling cultural references in lessons – while the popular, cocky Ram (Fady Elsayed, Brotherhood) presents as a footballer full of teenage swagger. The first episode, ‘For Tonight We Might Die’, is funny and frenetic, introducing both the series setup and the main players at breakneck speed. We delve into their lives against the backdrop of an alien assault, on the night of the autumn prom, and the consequences are brutal. Appearing in a (one-off?) guest role, the Doctor is used sparingly, but when he does arrive Peter Capaldi is on sparkling form, reminding us what we have been without during these barren, Doctor-less months between Christmas specials. At a slightly slower pace, ‘The Coach with the Dragon Tattoo’ deals with the consequences of the traumatic opener, and its life-changing ramifications, as the friends come together to face off against a further alien incursion. While less hectic, it is remarkably gory and thoroughly deserving of the show’s “not suitable for kids” tag, if not quite pushing it as far as Torchwood did on occasion. With a few pleasing visual references sprinkled around, Coal Hill has been granted an extensive remodel during its recent upgrade to Academy status, and for the most part, the action takes place in an ever-adaptable corridor set (well, this is the Doctor Who universe), Miss Quill’s classroom and the school hall, as well as outside the building and on the sports field. Ed Bazalgette (who helmed Doctor Who’s ‘The Girl Who Died’ and ‘The Woman Who Lived’) directs the first pair of episodes and brings Ness’s scripts to life with economy, as well as using some smart editing. Sherlock-style on-screen graphics and split-screen are employed too, highly appropriate as these are young people who spend an ungodly amount of time on both Skype and Facetime. While rather obvious, the Buffy comparison is a strong one; by the end of Episode 2 we have tasted both a recurring threat and been granted a mystery to follow. Class looks set to occupy itself heavily with its characters’ emotional lives too, each coming with some complex baggage (as do we all). There’s ample comedy to match the drama though, and if April is the heart of the show the Tanya looks set to be the soul with a down to earth attitude and an ability to bag a lot of the best lines. As Doctor Who and genre fans, despite being well past our teenage years, we can see there is plenty to love at the new Coal Hill Academy. It is early days, but Class comes across as fast, funny and at times a touch frightening – we hope that proves to be a winning combination. Available from 10am on Saturday 22 October 2016 on BBC iPlayer. Seems all reviews to date similarly glowing and reckon this is a big winner. Nice to see universal praise for Katherine Kelly too. Sounds like this is destined to be a hit with series 2 already planned. Wonder if Miss Quill might end up appearing on Who at some point? After so much hate and negativity such a pleasure to read that this is a success! Those who know Patrick Ness’ work will not be surprised. It doesn’t need to compete with SJA as that is a different audience. I gather from the reviews that Class is head and shoulders above SJA and Torchwood due to the overall excellence of the writing, acting and production. Bless SJA, but the production values were CBBC level (as expected and appropriate) and of course Torchwood was a hot mess in terms of writing and often acting. Series 10 of Who is shaping up wonderfully after the magnificent critically acclaimed series 9, but Class might just about give it a run for its money! I loved the SJA for what it was, at times feeling more like old-school Doctor Who. Love your description of Torchwood as a “hot mess”, the first year was tonally all over the place, but I thought the second settled down… and then CofE was superb (if haunting – as a parent I find it a tough watch). Haven’t been back to Miracle Day if I’m honest! But neither hit the ground running like the first ep of Class. Fingers crossed for good things! CofE just didn’t seem part of Torchwood, it was too good. That may partly be the tighter production team BTS and of course, it also blew all of the DW Specials Year out of the water by comparison too, so 2009 was the banner year for Torchwood, at the same time Who was at one of its lowest points in terms of quality of writing and acting. Peter Capaldi was simply astounding in CofE, so it can’t have been a surprise when he turned up on DW and just completely made the show his own. Anyhoos, lots more fantastic Class reviews coming out. If the scenes between Peter and Katherine Kelly are as fantastic as everybody is saying, I really do hope they find a way for either Peter to appear in series 2 of Class next year or alternatively, Katherine to guest on DW. The incredibly positive reviews for Class should also help build more excitement for DW’s return as well. We really are being spoilt as there really isn’t that long until Who returns with the much vaunted Christmas episode which has had all of the production team raving about the quality of Moffat’s script. Last Christmas with River Song seems a long time ago, but if Who can manage the sublime quality of series 9, it will be well worth the wait! I REALLY like the sound of that. Everything I see and hear about Class has made me more and more excited for it – thanks goodness that, if this review is anything to go by, it totally lives up to that! Can’t wait ’til Saturday morning. You like the sound of everything! How dare I actually like stuff. I’m clearly scum. 22nd October 2016 is the debut of Class. 22nd October 2006 is the debut of Torchwood. Coincidence? Or just something that will get the BringBackCaptainJack crowd fired up? You decide! I’m sure it’s just schedulers coinky-dink, but what show wouldn’t benefit from an injection of Captain Jack! Good to hear it’s good. I hope it runs and runs. Great to hear this is getting unanimous spectacular reviews. As it seems to start out so strongly and they have spent time on characterisation, this should have potential for a long run. BBC and the producers will be incredibly pleased with such an enthusiastic reception for the show. 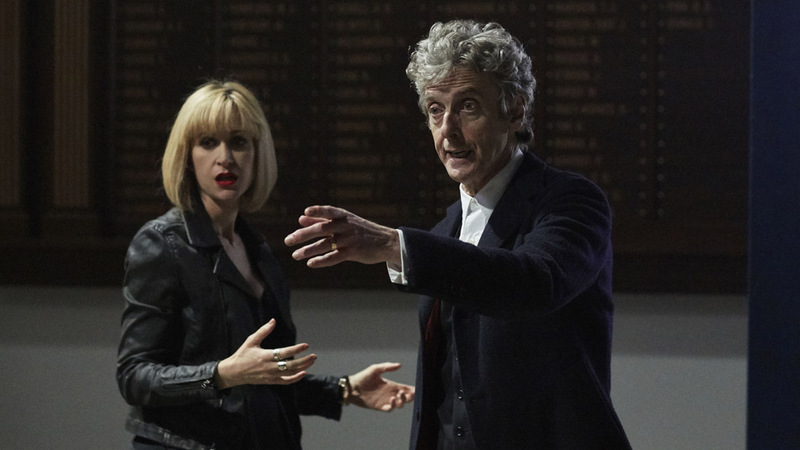 Add me to list of people who would love to see Katherine Kelly on Who with Peter Capaldi. She is an actress like Sarah Lancashire who cut their teeth in the soaps and whose potential has soared once they moved on. Really looking forward to learning more about Miss Quill. Katherine has been singled out for particularly effusive praise and seems to have joined Alex Kingston’s River Song and Michelle Gomez’s Missy at the very top of strongly written and wonderfully realised female characters in the Whoniverse. Our household are chomping at the bit to see this, particularly since Peter’s cameo appearance has been revealed. I am sure it is as ‘electrifying’ as reviewers say! All of the positive reviews for Class are brilliant to hear but it needs to get viewers. I don’t know how hard it is to accurately track BBC3. I hope this is the success it clearly deserves to be and it has got its second series ordered which is great. My slight worry is that brilliant reviews don’t always automatically equal lots of viewers. Last series of Doctor Who got by far the best reviews the show has ever had from TV critics and viewers alike not just in the UK, but pretty well around the globe, but fewer people watched in the UK than series 8. (Before everyone jumps on me, yes I know viewing figures in the US, Australia and elsewhere were the highest ever, but it is still a show that needs to rate well here).The promotion for Class has been good and certainly better than the rubbish job BBC did last year with Who, so let’s hope the ratings are good and it leads on to a rise in viewers for Who next year as well. It might also prove to Who’s publicity people that you DO need to work hard and creatively at promotion and not take things for granted. I give For Tonight We Might Die a 8/10. It kicked things off in style, the Shadow Kin look and sound great, the cast are all excellent, all the main characters are interesting and the short time with P-Caps was amazing. Then there was The Coach With the Dragon Tattoo which gets a slightly lower 7/10. I had to knock off a mark for the gruesome imagery going a little too far than it needed to and for the rushed resolution, but Ram is going through a fascinating character arc in it and his dad is awesome. Also, I freaking LOVE Miss Quill. OK. That ended up being really good and lives up to the early hype. Add me to the fans of Miss Quill. The standout character so far, although Ram is also great. Really interested in finding out ratings. Peter Cap was typically brilliant – seeing him makes Christmas seem a long way away. I would rate the first episode 9/10 and the second probably more like 8/10. Still good but extra mark for the 12th Doctor’s amazing cameo which was the highlight of an incredibly assured start. Top of the Class indeed. Barely five minutes in and the characters had already mentioned the Bechdel test and gender specific dress for the prom. Thankfully though, that was it and the show moved on with the story. Watched three episodes so far and really enjoyed it. The stories – much better than a lot of the Dr Who ones recently, the violence and gore plus relationship stuff is ‘Torchwood’ again but without the annoying Gwen so that’s a relief, and the characters are showing signs of becoming much more interesting after the initial introduction to the various stereotypes – jock, nerd etc. Quill is excellent. Favourite character so far. However, the set up is very odd. The doctor has left them all to face everything that comes through to attack them with .. nothing. Even Sarah Jane had a super computer, K9 and a sonic lipstick ffs.